Sebastian Vettel's first win at Spa, his seventh of the 2011 season, moved him 92 points clear in his quest for back-to-back world titles as team mate Mark Webber completed a tense 1-2 for Red Bull Racing. Jenson Button, who started 13th, drove an aggressive race to take the final podium place after McLaren team mate Lewis Hamilton crashed out after contact with Kamui Kobayashi. Red Bull technical director Adrian Newey (see separate interview) admitted that it was "one of the scariest races I've ever been involved in." Newey's tense afternoon had its roots in the limited running the teams had in dry conditions on Friday, when some experienced blistering on Pirelli's soft option tyre. After qualifying, with Vettel on pole, Lewis Hamilton's McLaren second and Webber third, all three had significant blistering to the left front Pirelli option on which they would start the race. Pirelli told Newey that tyre failures were imminent but they couldn't be quite sure when. On hearing that, Red Bull claimed that the circumstances were abnormal, like Indianapolis 2005, and requested that the tyres were treated as damaged, which the regulations allow to be changed. The complication was that Pirelli recommends a maximum of four degrees of camber and Red Bull had run more than that. A decision to allow the team to change tyres without penalty when rivals would claim that the damage was self-inflicted, would have gone down like a lead balloon. Newey claimed that the team ran just "a hair over" Pirelli's four degree recommendation, "four and an eighth, something like that," (the actual FIA measurement was 4.36 degrees) and that they were not aware there would be safety implications. The team had a dilemma: start on the damaged tyres and risk a failure, or breach parc ferme regulations, change the tyres and set-up and start from the pitlane, effectively ruling out any chance of a win. After lengthy consultations they elected to increase the front pressures to prolong tyre life, restrict use of DRS, which increases loadings, and go for it. It was not the ideal time for the cars to bog down as the lights changed, but that's what happened. Vettel pretty much got away with it, losing out only to Rosberg's Mercedes, which got a tow out of La Source on the opening lap and blatted by on the run to Les Combes. Webber, by contrast, was engulfed by half the field when the anti-stall kicked in. Luckily for Mark though, he benefited from some typical chaos at the first hairpin. Bruno Senna, after qualifying a fine seventh in his first race for Renault, arrived far too quickly at the hairpin and, maddeningly for Jaime Alguersuari, who had qualified a career best sixth, cannoned into the Toro Rosso, eliminating the Spaniard on the spot. Senna pitted and recovered to finish 13th. The man who started there after communication problems at McLaren in qualifying, was Jenson Button. "Turn 1 was mayhem," Button said, "caused I think by the guys at the front getting poor starts. Paul Di Resta hit my rear wing and half the end plate was gone. Then after Turn 1 someone's wing (Senna's) blew off, went through my wing and took the mirror off, which was a bit scary, a bit close to my head..."
Button had started on the medium tyre and the team told him that they knew the wing was damaged but to try to keep going. Jenson did three laps before pitting for a new nose and doing the rest of the race on option tyres. Webber crossed the line eighth at the end of the opening lap and with his tyres in worse shape than Vettel's the team called him in after just three laps and put him on the prime (medium) tyre. He rejoined 15th and immediately started lapping 2s quicker than the front runners. Vettel stopped two laps later and Red Bull had successfully negotiated the first potential problem. Surprisingly perhaps, a new set of softs was bolted onto the world champion's car. The man to watch in the early stages was Fernando Alonso, who had qualified an unrepresentative eighth after traffic issues. The Ferrari was fifth at the end of the opening lap and then Alonso dispatched Hamilton next time round. On lap 5 he dived inside team mate Massa in a move that also cost the Brazilian a place to the following Hamilton, then took the lead from Rosberg on lap 7 and started to go away. "In the end one of us had to lift," the Aussie smiled, "and I had a slightly better line, so that was Fernando." Webber had just announced an extension to his Red Bull contract the day before, his 35th birthday, and if anyone suspected that age may have dulled his motivation, they had their answer right there. "It was brave!" Adrian Newey said, and he was not wrong. It was also in vain because, on his new softs versus Webber's seven lap old mediums, Alonso re-passed relatively effortlessly with the benefit of DRS next time around. When Alonso had pitted it was Hamilton's McLaren that took the lead, Lewis running as far as lap 10 before stopping for a new set of options. He rejoined behind a gaggle comprising Kobayashi, Webber, Petrov and Sutil. Webber passed Kobayashi, Petrov pitted and Hamilton scythed inside Sutil and set about Kobayashi's Sauber. He passed the Japanese driver with the aid of DRS out of Eau Rouge but Kobayashi tucked in and attempted to come back at the McLaren on the outside into Les Combes. It looked as if Hamilton hadn't seen Kobayashi as he moved back across to take the racing line. The Sauber made contact with the McLaren's left rear and turned it sharp left into the barrier. Hamilton suffered a nasty impact and was out on the spot. Lewis later accepted full responsibility for the shunt. Lap 13: Safety Car. Vettel led by 5.5s from a closing Alonso, with Webber another 5s in arrears. What to do? Vettel's options were now eight laps old and he pitted. There should have been time to stop Webber, whose primes were now 10 laps old and clearly slower than Alonso's options, without significant delay. Christian Horner says that the radio traffic was busy and that the message telling Webber to pit, was blocked. "We had a bit of a stuff-up on the radio," Webber confirmed. "I was supposed to pit when Seb did but we had a completely blocked radio. I was asking three times 'do you want me to stop' and gave them the radio back, but I heard nothing. I saw that Fernando had stayed out, I stayed out and there was a bit of confusion. We then had to make it work by staying out and going very, very long and in the end it wasn't a disaster." In fact, Webber was able to do a 28-lap stint on the medium Pirellis before pitting for a new set with 13 laps to go. He may have been even quicker if the team had put him onto softs for the final stint, as Button was, but Red Bull was happy that the medium was a good race tyre and Webber proved it by immediately setting the race's fastest lap on his new set. The Safety Car brought Button's McLaren back into play after Jenson had dropped as low as 19th when he pitted early on. His overtaking was clean and incisive as he turned in a superb drive to finish on the podium. The McLaren on options had too much for Alonso's Ferrari on primes that were three laps older and Jenson went by Fernando relatively easily with three laps to go, towing past with the benefit of DRS on the run up to Les Combes. Despite his accomplished drive, Button saw Spa more as a missed opportunity. The McLaren had strong pace that, he believed, they hadn't made the most of. Ferrari was hopeful that it had solved the tyre warm-up issues on Pirelli's harder compounds seen earlier in the season, especially Barcelona, but the previous three races afforded little opportunity to find out. On this evidence the team still has work to do in that area because the Ferrari was no match for the Red Bull on the medium tyre, as Webber proved when he gobbled up the Ferrari and passed it with ease on his new mediums. The picture is clouded slightly by Ferrari reverting to a different type of rear suspension than seen at the previous three races but team principal Stefano Domenicali admitted that they are still working flat-out on solving those problems on the 2012 car. Fifth place was an all-Mercedes battle won by Michael Schumacher on the occasion of his 20th anniversary celebrations. Michael, eliminated from Q1 by a cross-threaded wheel the previous day, had mirrored Button's strategy of starting on a new set of primes and then taking three sets of options. The seven times champion came around 14th on the opening lap but stopped after four laps to go onto the options. He caught Rosberg, who was being told to save fuel in the closing stages, and passed Nico with three laps to go. Rosberg ran a two-stop strategy and, "although it was a little marginal with tyre performance at times, drove an excellent race," Ross Brawn said. "Towards the end we told him to trim his fuel: although we had a Safety Car period, you don't use it to save fuel under the current rules because any fuel saved is simply extra weight carried through the rest of the race and at that point his fuel consumption was on target. "In any case, it didn't cost him a significant amount of lap time and the decisive factor was that Michael was on the soft tyre at the end while Nico was on the medium, which was around a second a lap slower." Eighteen points was the team's biggest points haul of the season. Adrian Sutil got the first Force India home seventh, just 11s adrift of Rosberg, while team mate Paul Di Resta missed out on a point. The Scot was clobbered by Timo Glock's Virgin at the first corner, damaging the front wing and floor and sentencing Di Resta to an afternoon battling understeer. Felipe Massa could do no better than eighth with the second Ferrari, hampered by a puncture which required an extra pit stop. 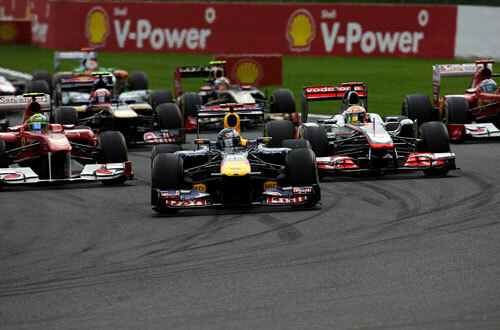 Vitaly Petrov finished ninth for Renault and Pastor Maldonado scored his first point for Williams in 10th place. The sobering thought for Red Bull's rivals was that at a circuit that has not been their strongest in recent years, the RB7 not only had excellent sector one speed via a skinny rear wing, it was also still devastatingly quick through the high speed turns of sector two.